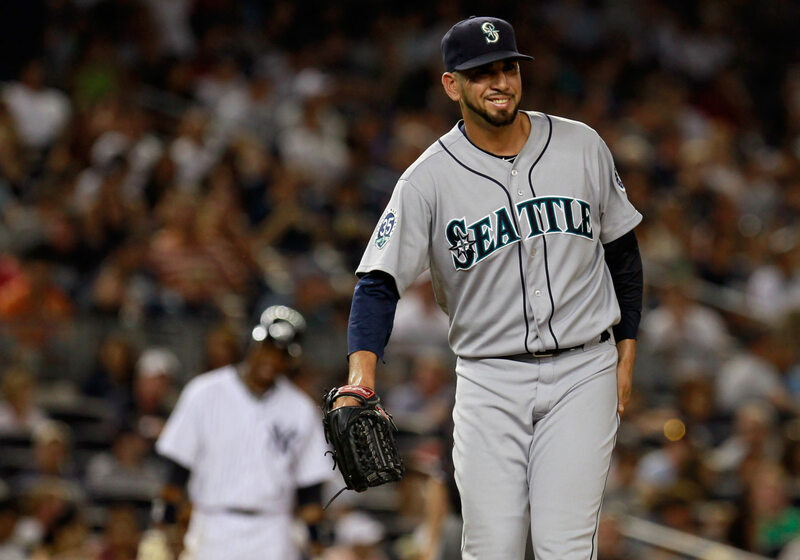 In the last few days, the Mariners organization has seen fit to re-sign Oliver Perez and claim Scott Cousins off of waivers from the Blue Jays. Rather than do separate posts on each transaction, it's all going to be written about here in this one post. Not for any particular reason, other than the fact I doubt I could write much more than two paragraphs about a guy like Scott Cousins. I'm sure he's a nice guy, which I'm not sure of at all really, but he plays baseball and that's what gets written about mainly. So we'll go in chronological order and talk about the wonderful and talented Mr. Oliver Perez. Perez flamed out as a starter while with the Mets organization and ended up in AA for the 2011 season at the age of 29 after starting 7 games and coming out of the pen in ten in 2010. He did fairly well against AA hitters, but seriously, I should hope so. After signing with Seattle, he became a permanent fixture in the Tacoma bullpen and did well enough to earn a promotion. I assume he got hot for a few games to earn it, because his ERA was 4.65 in AAA at the time. Either that or somebody saw something to be excited about and they gave him a shot. Whatever the case may be, he latched on with the major league club and never looked back. Perez had a 2.12 ERA in 29 2/3 innings, allowing 27 hits, 10 walks and 24 strikeouts. Two of the more amazing things about this past season for him was his lack of walks and his higher velocity. In previous years as a starter, ushers would bring people out of the stands to face him so they could see what it was like to walk against a big league pitcher and not be scared out of their minds due to his fastball being around 89 mph. Speaking of which, his average velocity had dipped from 91.9 mph in 2007 to 89 mph in 2010. In 2012, his average fastball velocity was 93.1 mph. He also apparently added a sinker to his repertoire. Strictly speaking, Perez wasn't just a LOOGY last season. He was used against both right and left handed hitters. Interestingly, he actually did better against righties than lefties. The sample size is miniscule though, and should be taken with a grain of salt. And with that, stats! In 61 plate appearances, righties hit .204 against him with 6 walks and 11 strikeouts. Against lefties, .281 with 4 walks and 13 strikeouts. Looking at the numbers, he could probably survive as a seventh inning type of pitcher, but he may be more effective as a lefty specialist and just let it fly for one or two batters every outing. The sample size is small, but less than 2:1 SO/BB against right handers and just over 3:1 against lefties. All of this resulted in a 1 year, $1.5m contract for next season with $600,000 in performance bonuses as an incentive. With Lucas Luetge already in the pen as a LOOGY, he may find himself in the minors by the end of spring training next season. He has options left whereas Perez is signed to a major league deal. It'd be crummy for Luetge after spending the entire season last year up in the majors, but I don't think he'd be there for long after what we saw last year. So who knows? The Mariners may carry two left handed specialists in the pen next year, make one a full inning guy or send Luetge to AAA. Only one way to find out. Well two ways, but bugging people's phones isn't something I'm entirely comfortable with yet. Cousins isn't really a player we need to sit and think about for very long. You can if you really feel the need, but then I'd have to question your sanity. In '10-'12, Cousins played for the Marlins and did pretty much nothing at the plate. Granted, he hit .297 in 37 AB in '10, but it was 37 AB and the next two years would mock you for getting excited about '10. He hit .135 and .163 the next two years while striking out once every 3 at bats, roughly. He's a left handed hitter who plays the outfield, has some speed but never steals bases. I guess you'd need to be on base first for that to happen though. In essence, Cousins is more of a roster filler than a player we get to watch every day. He's still making the minimum and it cost the Mariners $20,000 on a waiver claim to get a guy they're going to stick in the minors if they can pass him through waivers. On a side note, Cousins has been claimed twice in the last 3 weeks. He's either feeling really good about being wanted or really bad about having to pack again. If I were making the major league minimum, I wouldn't complain too terribly much.